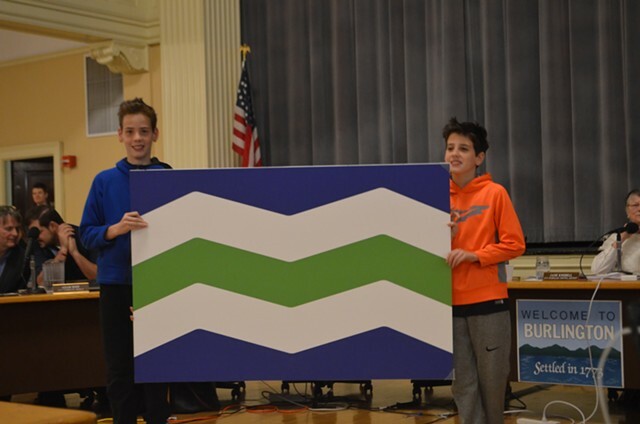 On Monday, November 27th the Burlington City Council approved a new City flag design, designed by our very own Edmunds Middle School Students Owen and Lucas Marchessault. Sandy Hawkes, an Edmunds Middle School Art Teacher, had said that this was a design challenge task for Grades 7 & 8 (and announced in Grade 6 as well – as a fun artistic opportunity) as they started the school year with exploring the Elements and Principles of Design. All were encouraged to make submissions but it was not required for class. The District is working with Burlington City Arts to get a flag at every school and a sticker for every student.